Combat Over Texas, Aviator Byron Q. Jones & Aviation Pioneer Lt. Thomas D. Milling. Kitty Hawk, North Carolina. Dayton, Ohio. North Island Naval Station in San Diego. And Brownsville, Texas. No listing of the key locations in the early days of flight – particularly the development of military air power – would be complete without a reference to the southern Texas city of Brownsville. It was from there that America’s first combat mission was flown, way back in 1915. The Army had created the 1st Aero Squadron about two years earlier, but in 1915, the terms ‘military’ and ‘air power’ were like a couple of shy kids on opposite sides of the gym at the 8th grade dance. Jones was at the controls of a flight in a fragile aircraft that took off from Fort Brown on April 20, 1915, in an effort to determine where the revolutionary forces of Francisco “Pancho” Villa were staging in the Mexican city of Matamoros. With Jones was another aviation pioneer, Lt. Thomas D. Milling, who was holding a map and a pencil during the flight, in the hopes that he could sketch in where the Mexican troops were that day. 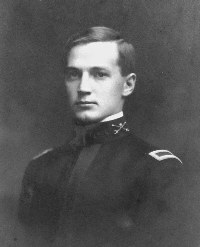 Byron Q. Jones shortly after he graduated from West Point in 1912. Following a course of instruction at the Wright Bros. Flying school in 1911, Milling helped organize Army aviation schools at College Park, Md., and Augusta, Ga. From 1917 to 1919, Milling was in charge of air service training in Europe, and also was chief of staff of the air service of the 1st Army with the American Expeditionary Force. He retired in 1933, but was recalled to active duty in 1942 during World War II. He died in 1961 and is buried at Arlington National Cemetery. In 1915, the Texas region was under the command of Major Gen. Frederick Funston. Already a Medal of Honor holder from actions in the Philippines in 1899, Funston had also won accolades and national esteem for his command of Army forces in San Francisco when the famed 1906 earthquake rocked that city. Had it not been for a fatal heart attack in early 1917, many at the time believed that it would have been Funston, not John J. Pershing, who would have commanded U.S. forces in World War I. 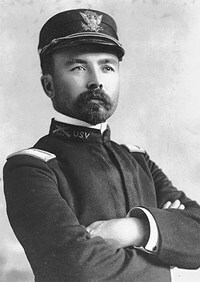 Major General Frederick Funston had won the Medal of Honor for his actions while engaged in the Philippines with the U.S. Army in 1899. In 1906, he had been in command of the Presidio in San Francisco and essentially took command of that city after the famous earthquake, though martial law was never declared. Funston was considered by many to be the most likely candidate to take command of the American Expeditionary Force, later commanded by Pershing, in World War I. Funston suffered a fatal heart attack in January 1917, a few months before the U.S. declared war and entered World War I. His body would lie in state at the San Francisco City Hall and he was then buried at Arlington National Cemetery. 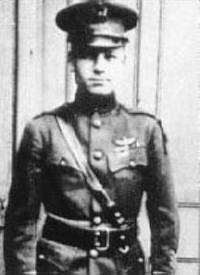 Funston ordered the 1st Aero Squadron at Brownsville to perform reconnaissance along the Rio Grande and report back to him. After arriving at the base, uncrating and assembling their aircraft, the men of the 1st were ready. On the morning of April 20, Jones flew the unit’s first mission from Fort Brown, taking off from the west end of the Cavalry parade & training grounds at the fort. His first mission was uneventful and after he landed, a second mission was planned for the afternoon. That both the morning and the afternoon missions both got off the ground at all was somewhat remarkable in itself. In those days, the Army had about a 50 percent success rate of actually launching planes, given the fragile and unreliable nature of the early machines. Jones and Milling clearly were the right men for the job. Earlier in 1915, Jones, a West Point graduate, had set endurance records as a solo pilot and as a pilot with passengers. Later that year he would successfully (and intentionally) perform the first aerial loop and become the first pilot to intentionally stall his aircraft and put the aircraft in a tail spin – and live to tell about it. Milling was one of the most experienced air men in the Army. He had been sent to the Wright Brothers flying school in Dayton in 1911 and had been the first man to receive a Military Aviator Certificate from the Army. He held the 30th pilot license issued in the world. Jones and Milling climbed aboard their Martin aircraft with a Curtiss “pusher” engine (the propeller was in the rear and “pushed” the aircraft), and the two men began to determine the where-abouts of Villa’s forces. 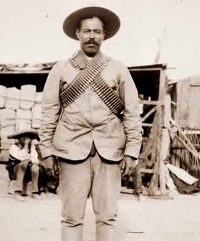 Pancho Villa was a Mexican revolutionary, who eventually took over the state of Chihuahua in Mexico. Given that Chihuahua bordered the U.S., conflict was inevitable. In his early years, he was supported by the U.S. government, even invited to meet with Gen. Pershing at Fort Bliss in Texas. That relationship eventually soured and the U.S. launched an expedition into Mexico in 1916 to eliminate Villa’s army. Many of his senior leaders were killed during the 1916 campaign and his army was scattered. Villa survived and remained an active player in Mexico, until he was assassinated in 1923. His legal name was José Doroteo Arango Arámbula. About 15 minutes into the flight, the U.S. aircraft drew the attention of Villa’s forces, who opened fire with at least one machine gun, as well as small arms. Jones was able to maintain his composure under fire. He opened the throttle and nosed up, climbing to 2,600 feet to avoid the gunfire. He maneuvered away from the river and was able to return safely to Fort Brown. Jones’ official Army biography sums up the combat adventure succinctly: “He was the first American pilot fired upon, flying over the river at Brownsville, Texas, by Mexicans using machine guns on the Mexican side of the river.” A Texas state historical marker at Fort Brown also memorializes the event. A couple of weeks after the historic flight by Jones and Milling, the detachment of airmen were returned to San Diego for more training. 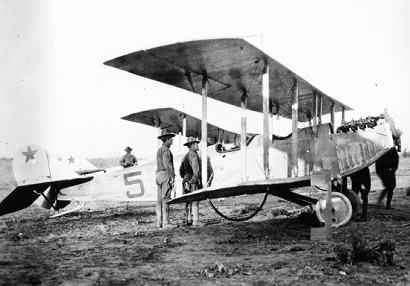 Later, during the 1916 expedition into Mexico, the 1st Aero Squadron returned to Texas and moved into Mexico. There, still hampered by the aircraft of the day, their primary value was in speeding communications between Pershing in the field and his headquarters back in Colombia, N.M.
Milling participated in the Mexican Expedition as part of the 1st, but Jones received different orders. With the Army still trying to figure out how to get the most out of its aviation assets, Jones was assigned to the Massachusetts Institute of Technology as a student, where he earned a graduate certificate in aeronautics. Milling retired from the Army in 1933, but was recalled to active duty during World War II. Following the war, he retired as a colonel. After his retirement, he was retroactively promoted to the grade of brigadier general. Jones remained on active duty through 1944. In the late 1930s, he transferred out of the Air Corps and back into the Cavalry branch of the Army. He retired as a colonel. He is buried in Arlington National Cemetery. Dan Heaton is a member of the Michigan Air National Guard. His book, Forgotten Aviator: The Byron Q. Jones Story, is now available from Branden Books.